It’s easy to get in a rut when it comes to holiday decorations, especially when you find yourself putting up the same arrangements year after year. Whether you’re looking to sell or just want to refresh your home’s holiday look, concentrating on your curb appeal is always a good place to start. Pick a focal point and build out from there. This is solid advice for anyone, but it’s particularly helpful if you’re overwhelmed and don’t know where to start. What’s your favorite aspect of your house’s exterior? Love the arch on your front door? Start with that: Add a long garland around the door frame and build out from there. Speaking of doors: If you do no other decorating this holiday season, put up a wreath. String lights usually get all the fun, but a beautiful, unique door wreath makes a big statement with a lot less effort. Using natural, local foliage for wreaths is a great twist on the classic. Live in the South? Try adding some citrus to your wreath, like this one from RealSimple. If the local foliage isn’t inspiring you, try a bow wreath or just head to your local tree vendor. They almost always have piles of free branches and scraps that you can use to make beautiful garlands and wreaths. Need more inspiration? This collection of unique wreaths from Better Homes and Gardens should spark some ideas. When you think about outdoor decorations for the holiday season, you probably see elaborate light displays and bright, inflatable snowmen. And don’t get us wrong — we love a big, beautiful display. But if you really want to up your holiday decoration game, you should explore more lighting options. Lanterns are always a great choice. Line walkways and scatter them around the yard. If you’re interested in an easy DIY option, make these beautiful ice luminaries. They’re a fast, easy craft you can do with your kids that turns water and balloons into gorgeous baubles. Place some tea lights in them and watch your neighbors’ jaws drop. And when it comes to putting up those string lights, there’s a lot you can do to stand out from the crowd. Forget the roofline; use your lights to call attention to your house’s unique architecture. Got bay windows? Line them with some snowfall lights along the top of the windows. Not sure what snowfall lights are? Don’t worry, this lighting guide from Bob Vila will give you a sense of the many options out there. And for a little inspiration, check out this Architecture Art Designs post, showing off 40 of their favorite lighting displays. Adding props to your decor plan will take your decorating to a whole new level. Classic winter icons, like sleds, skis, and ice skates always look great propped up against the porch railing or hung on a door. When it comes to props, less is more. A few well-placed items will stand out, but try to add too many props and the whole thing will look more like clutter than carefully curated decor. Browse through this collection of great porch ideas from Style Estate to jump-start the brainstorming. If you’re just starting out, decorating for the holidays can seem intimidating. But you can create an impressive display with just a little time and effort. And remember: When in doubt, stick with symmetry and simplicity. Classic holiday colors and plain white lights are never out of date and always elegant. Plus it’s easy to keep the colors coordinated. Most importantly, have fun with it! What are your go-to holiday decoration tips? 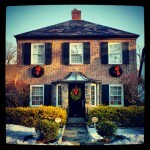 We’d love to hear how you make your house shine each holiday season. Find us on Twitter or Facebook and tell us all about it. And if you’re in the market for a new home to fill with holiday cheer, don’t hesitate to get in touch.